Rising stars The Struts have revealed details of the follow-up to debut album Everybody Wants. Young&Dangerous will be released on October 26, while the band have also released a new track, Bulletproof Baby, and announced a headline UK tour for February next year. Lead singer Luke Spiller says: "Finally we can reveal our second album, Young&Dangerous. We have poured our blood, sweat and tears into this album and I know you are all going to love it. "This is dedicated to all of our amazing fans who have waited so long for this record. I hope these songs provide the perfect soundtrack to this crazy thing called life. Thank you once again. Be sure to get tickets to our tour so we can all sing these new songs together." The new album features the previously released, Body Talks and Primadonna Like Me, with additional bonus track, Body Talks feat. Kesha. All three tracks be available instantly to those who pre-order of the album, in addition to Bulletproof Baby, which also features on EA Games’ NHL 19 soundtrack. 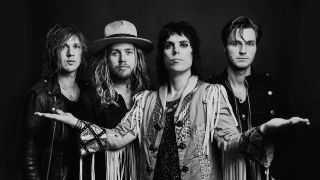 The Struts kick off the latest leg of their US tour on September 21, while UK dates kick off in Leeds on February 16 next year, and climax with a show at London's Shepherd's Bush Empire on February 26. UK tickets go on sale on Friday September 21 at 9am.